The upper floor of the Museum was added in 1882 to provide a residence for the Post Master and his family. The rooms continued to be used as a residence until about 1920. The room contains cedar furniture from local homes. The hip bath and chamber pots are reminiscent of a time when houses did not have running water or sewerage. The half tester bed is made of iron and brass and dates from around 1890. It is not as ornate as many beds from the period which had considerably more brass ornamentation.. The canopy curtains were generally ornamental. They were reminiscent of the full curtains used on full tester or four poster beds to exclude draughts and provide privacy. In areas where mosquitos or other insects were a problem, the curtains were sometimes made of fine netting. They covered the entire bed at night. 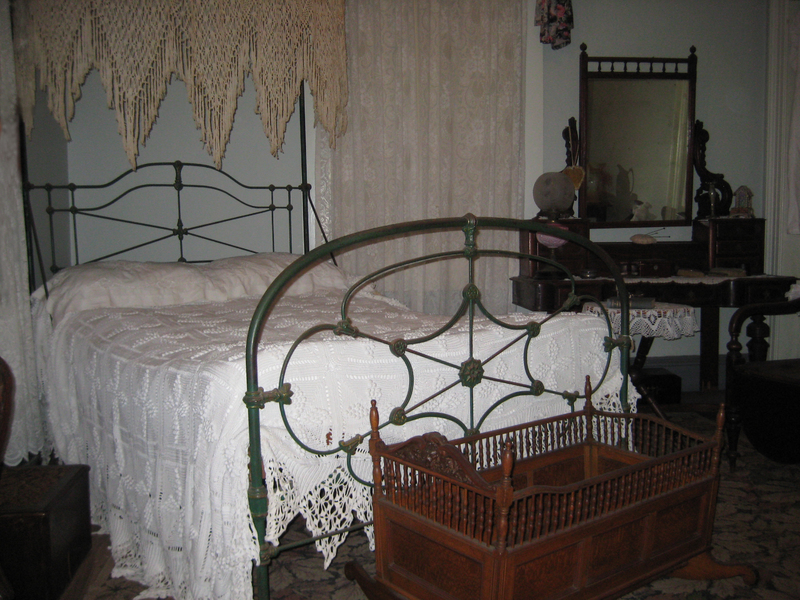 The mattress on this bed is stuffed with kapok which was popular from about 1890 until the 1950s. Earlier mattresses were stuffed with a variety of materials including horsehair, feathers and straw. Australian red cedar chest of drawer made about 1880. Australian red cedar dressing table made about 1890. Few homes had bathrooms in the Nineteenth Century. Baths were large tin tubs which were often placed in the kitchen where hot water was close at hand. In homes where there was a maid, baths were often taken in the bedroom. The maid would carry the water to the bedroom and later empty the bath and carry the water out to the garden.